Lily of the valley, known botanically as Convallaria majalis, produces white or pale pink, bell-shaped blossoms in spring from an underground rhizome. Thriving in partial to complete shade and moist soil, lily of the valley rhizomes naturalize quickly to establish a deep green carpet of smooth leaves. They are widely grown in woodland gardens, in beds and borders and as ground cover in semi-shade settings. Lily of the valley is hardy in USDA zones 3 through 9 and require little maintenance or pruning. Deadhead spent blooms after flowering to encourage the production of fresh bloom and to keep the plant looking tidy. Inspect your lily of the valley stand regularly and cut away any damaged, discolored or dying leaves down to ground level when you see them. Dig up and divide lily of the valley rhizomes or pips in the spring or fall when their planting areas become congested or overcrowded. Pull the segmented pieces of rhizome apart and replant in the soil at intervals of 4 inches, 1 1/2 inches deep. Water in the divided rhizomes so that the soil is drenched but there is no standing water. 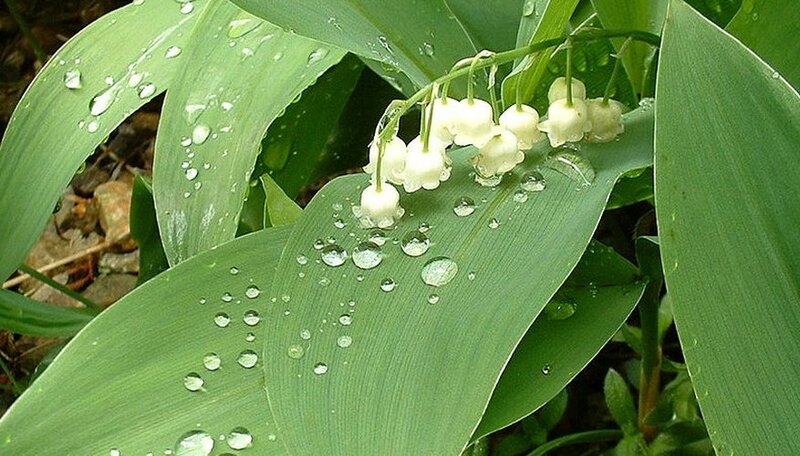 Harvest lily of the valley blooms and leaves in spring for household floral arrangements and gifts. Use clean, sharp secateurs or scissors to cut the foliage and stems clean down at the soil. Store in clean, cool water changed daily to prolong vase life. Though it smells and looks sweet all parts of the lily of the valley plant are toxic to humans and mammals.